Tiger Martial Arts, LLC is a family owned training facility that teaches the Korean art of Hapkido, and has been in business in Ascension Parish for over 6 years. Hapkido is a Korean Style Martial Art that redirects the attacker's force back upon them while utilizing a combination of joint locks, pressure points, strikes, and pain compliance. Tiger Martial Arts is located in Dutchtown, LA, and is easily accessible to anyone in Ascension Parish, and the South Baton Rouge area. Hapkido is a creative art that combines the power of the mind, body and spirit. This art teaches joint locking, leverage, pressure points, and pain compliance, making this art excellent for women, children, law enforcement, and anyone else who is interested in learning an extremely powerful art of pure self defense. We start with the basics and work up toward teaching students how to react to sudden attacks. For our advanced students, we teach a variety of weapon techniques. 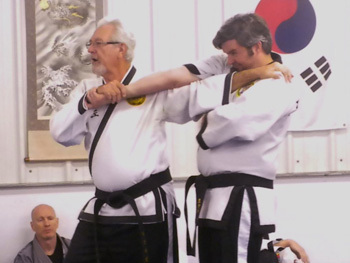 Our Black Belt instructors have over 60 years of combined Martial Arts training. We regularly post our activities and promotions on Facebook, so be sure to click the Facebook icon above to view posted pictures, updates, and what’s going on in our school! We invite you to call 225-673-6391 for more information and free introductory lessons. Great place for kids to have fun learning self control as well as self defense! The instructors are kind, fun and firm about being all in and getting something from each class. I love the hands on techniques and one on one work given to my children. You guys rock- you did a fabulous job today!!! Not only have we become more aware of self defense techniques, but we had a great time!!! Thanks again!!! Tiger Martial Arts in Prairieville is the BEST! The instructors are amazing! They take their time with each student and make learning fun. My daughter loved it there. Unfortunately, we moved out of state. We have not found any place that compares. You won't find a better place or better instructors. When we move back we will be signing up again!